Enjoy a Bonfire This Summer with CobraCo Fire Bowls! One of the best activities to do during the summer is have a bonfire with friends and family to unwind at the end of a beautiful summer day! We could never personally host a bonfire at our house because we didn't have a fire pit or fire bowl to put a fire safely! So many times my husband and I have looked at each other and wished to end a stressful day sitting around a fire after the kids go to bed and just talk! Well, thanks to Avant Garden Decor, we now have a really sleek, modern and awesome fire bowl: the CobraCo® Contemporary Round Fire Bowl. We now have no excuse not to have fires (except for the fact it is 100 degrees around here lately!) and host family bonfires around our new fire bowl! A true modern beauty, the CobraCo® Contemporary Round Fire Bowl will add a refined warmth to your outdoor area. 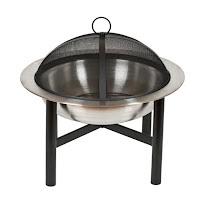 This fire bowl has a sleek metal finish and black powder-coated legs. Since we don't have a lot of open area around our house, we are so glad this fire bowl comes with a heavy duty spark guard cover to prevent sparks and ash from blowing! I also really love the protective vinyl cover for protection from our harsh winters! The best part of all is how easy it is to set up! It was literally put together in minutes! Here are all the parts! Not too many and it looks pretty simple to put together! First, he put together the support base! And here is the finished fire bowl! Isn't it sleek and stylish looking??? We can't wait to get a little bit cooler day so we can host our first bonfire in our new Copper Co. fire bowl from Avant Garden Decor! Buy It: You can purchase the CobraCo® Contemporary Round Fire Bowl for $298.00 on the Avant Garden Decor website.